You’re a licensed skydiver, your flying career is well underway, and you’re ready to try something new. Perhaps you’ve done some knee-lock exits and gotten a taste of sit flying. Why not make a goal for this upcoming season: learn head down skydiving. It’s going to be tempting to just get out there and start aiming your noggin to the earth – but taking the time to go through each level is worth it, not just for the skills but also for safety. Even experienced pros cork out now and then. One of the most important things you can know is how to control your skydiving flying technique to get out of the way and maintain that vertical speed. This is more than just going limp and falling with your back to the earth. It’s the easiest position to transition into without slowing all the way down to belly-flying speeds. It’s a versatile step that will help you gain familiarity with the faster speeds, the new orientation, and for more advanced moves later on. Flying head up is fun all on it’s own, but it’s also a great way to maintain those fast free-flying speeds and stay with the skydive if you stumble out of the position. It takes a few jumps to become proficient as it’s a bit like ice skating: you’ll need to find your balance to move along smoothly and relatively to others. When it comes down to it, it’s a pretty simple concept that takes some work to perfect. Your head is pointed to the ground, and your feet are up toward the sky. Simple, right? Not exactly. How Do I Get Started with Head Down Skydiving? 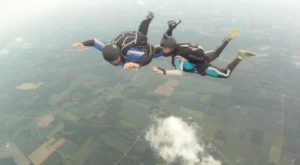 There are several techniques you can use for head down skydiving – however we recommend working with a coach. When you go out by yourself and start cartwheeling, you’re going to feel the difference in flight. The air is hitting your head, your shoulders, and you can swear you’re doing it. Guaranteed, you’re doing something, and there’s a good chance that “something” is backsliding. A coach will help you know what your body is doing and what it should feel like. They’ll also be able to give you some drills for solo jumps that are specific to your skill level. 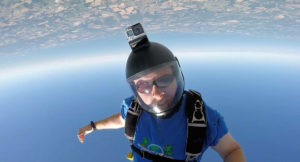 What Are The Dangers of Head Down Skydiving? Because going head down in a skydive is so streamlined, you’ll find yourself going at much higher speeds (roughly 150-180 mph). You have to be prepared to react even faster. You’ll need to make sure all your equipment is appropriate for the high speeds and is on secure. Also, you’ll need to be prepared for shorter freefall times than the traditionally belly-to-earth skydive. As with every skydive: stay altitude aware! 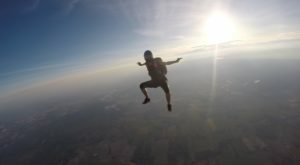 Once you get the hang of it, doing head down skydiving is a super versatile way to fly. The large range in horizontal and vertical speeds lends itself to huge possibilities in multi-layered formations, dynamic skydives and world record formations. Keep it simple at first, and with experience you’ll have more and more opportunities to make magic happen. Ready to add these new skills to your inventory? Head on over to check out our Advanced Skydiving Training Courses and sign up!